Episode 13 of Jigoku Shoujo Mitsuganae, “Six-Script Lantern”, starts on a nice and sunny day with Yuzuki and Akie outside. Being the good friend she is, Akie has noticed that something has been distressing Yuzuki for a while and offers a chance to talk about it, but Yuzuki says she’s fine and doesn’t talk about it. It’s not surprising that Yuzuki turned down Akie’s offer as having the Jigoku Shoujo inside her is a pretty unbelievable thing to talk about. But Akie is still someone who is helping Yuzuki maintain her sanity. Episode 13 of Shikabane Hime: Aka, “Agenda for the Contract Monk’s Funeral”, is half recap and half interlude. While Keisei’s public funeral is scheduled for the night, Kougonshuu monks are holding their own ceremony for the departed monk during the day. Ouri notes a number of girls waiting outside, some of whom we have already seen but also quite a few we have never seen before, who are all obviously shikabane hime. They’re not allowed to attend funerals, however, so they can’t go inside the temple. It’s kind of odd seeing how they all dress differently, in contrast to their contract monks whose drab attire are all the same. 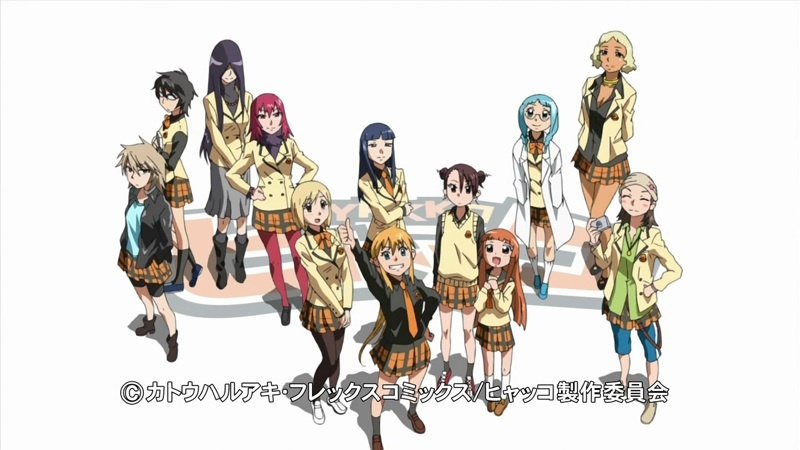 And they’re all female without exception, which makes me wonder why there isn’t a “shikabane ouji”. Following immediately after episode 12, the thirteenth and very last episode of Hyakko starts on a rainy day with one or more people sleeping at a bus stop with dismantled boxes in lieu of blankets, after which the opening credits start. It is April 4, the first day of school at Kamizono High School for the incoming high school students, and we get to see how each of the girls we’ve seen so far prepare for their new life. With eleven episodes, the second season for Nodame Cantabile has ended. 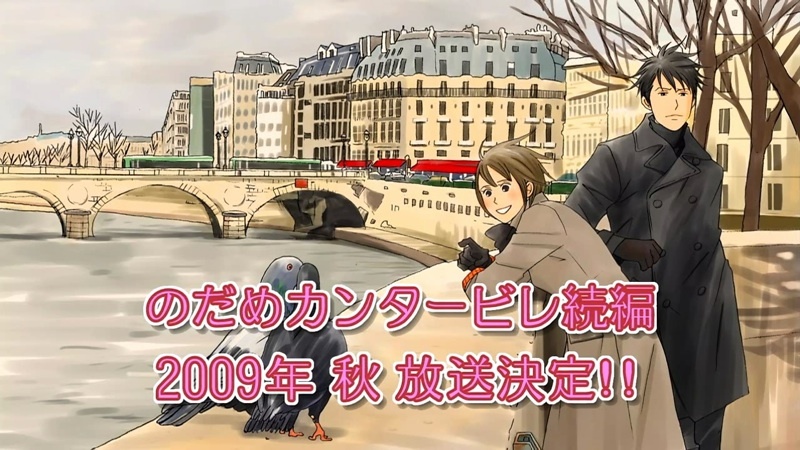 Like the first season, it was hilarious to see how Chiaki and Nodame interacted with each other and with others with all their personality quirks as they develop their musical talents in Paris. And despite the slapstick, the characters aren’t shallow and have real character development. Even the relationship between Chiaki and Nodame has developed beyond apparent fondness and one-sided love-sickness with the hidden mutual love. The one disappointment I had with the series was with the last episode, which seemed rushed as Chiaki lead an apparently hopeless orchestra back to respectability. In related news, a sequel will start broadcasting in the fall of 2009. It will be great to see how the musical careers of Chiaki and Nodame develop, not to mention the relationship between them. I suspect there will also be new rivalries and relationships that have only been hinted at in this season. From the preview, it looks like episode 12 of Jigoku Shoujo Mitsuganae, “Graph in the Middle of the Summer”, will be the silly episode of the season. However, it doesn’t start out that way, as Yuzuki and her friends are at the pool eating snacks at a vendor a friend is helping out with. Everyone except Yuzuki ordered yakisoba, or fried noodles, but decided to eat popsicles instead after seeing how delicious and cool Yuzuki seems to be eating her own popsicle. It’s ominous in that a part-time worker for the vendor is enraged as the girls throw away the yakisoba they had ordered and he had prepared. Will this force Yuzuki to take direct action as he takes out a grudge against a close friend of hers? Or will he suffer outrageous setbacks as he tries to take out a grudge on Yuzuki? Episode 12 of Shikabane Hime: Aka, “Dawn”, starts off from where the previous episode ended with the stabbing of Keisei by a possessed Ouri. However, Keisei quickly realizes what has happened and exorcises Ena’s control from Ouri. Too bad for Ouri that it wasn’t a dream, though, as he was aware what was happening. Episode 11 of Hyakko, “Escaping from the tiger’s mouth”, starts off with the classroom teacher happily opening the packaging for his new cellphone, the replacement for the one Torako destroyed in the previous episode. However, he realizes how childish he must look to the teacher sitting next to him and tries to make excuses, but he needn’t have bothered since the other teacher is stuck in her own world worrying about her sick Yuki she had left at home. As the other teacher heads home sick with worry, she asks the classroom teacher to take over her English class scheduled for the next hour. Episode 11 of Jigoku Shoujo Mitsuganae, “Blotted Page”, starts off with a twisted teenage boy dropping off a teenage girl from a skyscraper in Tokyo. Back to our local region, Akie talks to Yuzuki about the serial killings which are rumored to be oddly similar to those that appear in a mystery novel that was just published, which unsettles a young man standing nearby as he overhears them. In case you’re in the United States impatiently waiting for the release of Shikabane Hime: Aka, you might be interested to know that FUNimation, the company licensed to release the anime in the US, has been offering subtitled broadcasts through YouTube for some time now.